In the Holy Old Testament days, Moses and Aaron carried a "staff or rod". Most likely it was a straight piece of wood, with a small curve at the top. Many Biblical scholars believe the symbolization behind the staff or rod to be "God's protective Holy Hand" upon His people that did His Good and Holy Will. From the Prophet Moses, who held the rod to perform miracles, to the High Priest Aaron, whose rod performing miracles without being held, the rod symbolized our Lord's Holy Hand. Throughout the Old Testament and into the events of the New Testament, the rod held great significance of our Lord's presence, keeping His people in unison and guiding/guarding those who chose to do His Holy Will. The Israelites followed the staff before them; they observed the staff that brought forth miracles and wonders; and they also learned the staff's defensive capabilities in times of dangers. Yet it was not the piece of wood but God's supreme power through the visual formation of wood. The staff or rod was a rudimentary symbolization of the Hand of God being upon His people who chose to obey His Holy Will. It was a familiar and simplistic means to demonstrate without God performing through it there was nothing but lifeless, non-moving lumbar with other fundamental uses. Without the divine power of God, the staff was merely a functional piece of wood used by shepherds to guide their sheep or nomads to support the fatigue of the constant journey. Moses was commanded whenever the Lord's Holy Miracles were performed, he was to lift up his staff first (toward Heaven), and then the miracles were wrought. When Moses was commanded to take a staff and smite the waters in Egypt, the water became blood (Exodus 7:14-18); when Moses rod was stretched out over the streams, multitudes of frogs came forth (Exodus 8:1-11); when Moses rod was stretched out toward Heaven hail profusely fell (Exodus 9:23); and when Moses rod stretched out over the land, locusts blanketed the land (Exodus 10:12). The staff would serve to free the Israelites from slavery. Supporting the hand and arm of man, the rod was good utilization for extending the hand symbolic of the power of goodness and truthfulness. Sincere is the man who extends his hand in Godliness. God would call leaders in battle to extend their hands upward; to extend their hands to hold trumpets, and to extend their hands to carry the Ark of the Covenant on poles. Many scholars believe the rod of Moses was placed within the Ark of the Covenant. There was no mystical connotation to the staff or rod. It was often used metaphorically throughout the Holy Bible alluding to the Divine omnipotence of the Lord. Isaiah the prophet said metaphorically: "For behold, the Lord, the Lord of hosts, takes away from Jerusalem and from Judah the stock and the store, the whole supply of bread and the whole supply of water; the mighty man and the man of war, the judge and the prophet, and the diviner and the elder; the captain of fifty and the honorable man, the counselor and the skillful artisan, and the expert enchanter" (Isaiah 3:1-3). The staff of bread denoted support and power of the truth of goodness, and the staff of water, support and power from the truth of faith. The staff of bread is mentioned similarly within Holy Old Testament Book of Ezekiel, the great prophet, in the following references: 4:16; 5:16; and 14:13. Also in the Holy Old Testament Book of Isaiah it is written: "Woe to Assyria, the rod of My anger and the staff in whose hand is My indignation” (Isaiah 10:5). The Holy Books of Zechariah (11:10; 11:14), Jeremiah (48:17), and Hosea (4:12) all used similar verbiage. Zechariah explicitly proclaims the staff of strength denotes power from good and the staff of beauty denotes power from truth. Perhaps King David himself describes the use of the "rod and staff" most eloquently and beautifully in the 23rd Psalm: "Yea, though I walk through the valley of the shadow of death, I will fear no evil; for You are with me; Your rod and Your staff, they comfort me" (Psalm 23:4). "Your rod and Your staff" denote the Divine truth and good, which have strength beyond measure. 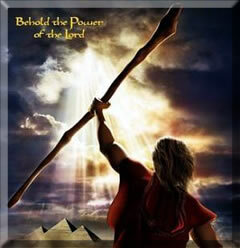 The rod or staff was referred to when kings designed their scepters. This term continued in use today by shepherds as their only equipment to guide and discipline their flocks. The Coptic tradition asserts that the miraculous flowering of the rod of Aaron was also considered a type of the Incarnation of our Lord Jesus Christ and His Holy Virgin Birth and appears in many Coptic Icons of the Annunciation to St. Mary Mother of God. Also to reflect upon is the rod made of wood, made of simplicity, once cut is without life. The Divineness is with the God's presence working through it. The same can be said of the wood of the Holy Cross inspired with the Divinity of the One Who hung upon it and Whose Divine Power led millions two thousand years later to the foot of its wooden composition. This typological comparison of Moses' rod as the Holy Cross is one rooted within the early church fathers. Origen on the Old Testament Holy Book of Exodus says: "This rod of Moses, with which he subdued the Egyptians, is the symbol of the cross of Jesus, who conquered the world." May our Lord's rod and staff comfort us all the days of our life and may we dwell in the House of the Lord forever. Amen.